3D printer improvements: Poll: what are the features you added to your stock Ultimaker ? 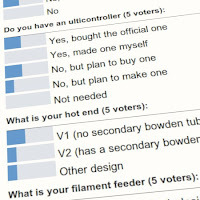 Poll: what are the features you added to your stock Ultimaker ? What are your Ultimaker features? 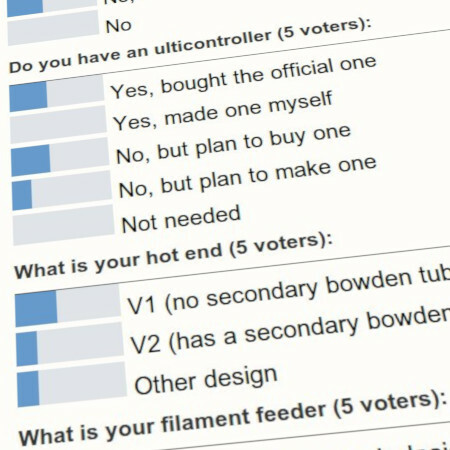 Here is an on-going poll motivated by this post on the Ultimaker google forum. So please keep your comments for the forum! I finally developed my own blogger poll system after failures with the official and restrictive blogger polls. I did not want to have my blogger poll other than within a regular post. So I copy/pasted the html code of two blogger poll widgets into one single post. But for some reasons, they soon started to reset their counters regularly. Hence this replacement. Once you vote, you will see the stats. Leave your mouse on the bar graphs for numbers and percentages. not seeing a poll with either firefox or IE so unless it's flash based (don't have it installed on this box) something went wrong! How to use Openscad (3): iterations, extrusions and more modularity! Major wood FDM printing breakthrough ! This work is licensed CC BY-SA 4.0. Awesome Inc. theme. Powered by Blogger.